This post continues a review of key points in Ron Highfield's book, God, Freedom & Human Dignity: Embracing a God-Centered Identity in a Me-Centered Culture. For other posts in the series, click a number: 1, 2, 3, 4, 5, 6, 7, 9, 10, 11, 12, 13. We ended the last post in this series noting that, due to the fallen condition of our human nature, we do not trust God fully and are thus unable to know ourselves fully. As Highfield emphasizes, our true humanity and thus our true human identify is found in the humanity of the incarnate Son of God, Jesus Christ, who, according to Highfield, "embodies in this world the eternal life of the Trinity" (p. 151). As we will see this time, Jesus' humanity was perfected over the course of his earthly life through all that he experienced including times of intense trial and temptation endured on our behalf. Through multiple temptations (including those noted below), Jesus learned to trust and obey his Father at the deepest level of his humanity. He did this on our behalf and for our benefit as our representative and substitute. Thus we refer to the "vicarious humanity" of Jesus---a humanity that was perfected through trials. A primary time of learning/perfecting for Jesus in his human nature came at the beginning of his public ministry when Satan, following Jesus' baptism, sought to overthrow Jesus in the wilderness (Matthew 4:1-11). Through multiple temptations, Satan sought to undermine Jesus' confidence in his heavenly Father, sought to tempt Jesus into taking his ministry into his own hands instead of patiently following God, and sought to tempt Jesus into worshiping him instead of God. Another primary time of perfecting for Jesus came at the end of his earthly ministry in the Garden of Gethsemane. 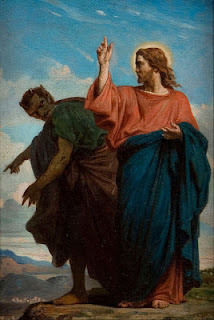 There, on the night before his crucifixion, and apparently now aware of the Father's plan that he would suffer and die, Jesus was tempted to turn away. But, through prayer, Jesus withstood the test and entered willingly into his greatest trial. He willingly offered himself as the sacrificial lamb taking our place. In commenting on this event, Highfield draws a comparison to the story of Abraham (representing God the Father), who offered up his son Isaac (representing all humanity) who is then replaced by the sacrificial lamb (representing Jesus, the Lamb of God). In this time of testing at Gethsemane, leading to his arrest, trial, scourging and suffering and death on the cross, Jesus kept his mind focused on the truth and reality of his identity and mission. 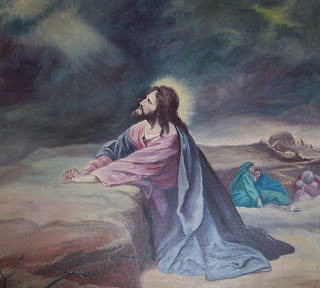 Though the temptations to turn from God's will were great (and at Gethsemane, in a moment of intense mental anguish, he did pray for escape), "Jesus never willed anything contrary to the Father's will" (p. 157). Through all these tests (and many others throughout his life) Jesus remained committed to the Father, to the Father's mission, and to us, the beneficiaries of God's mission to save the world. Jesus knew that everything we have, every moment, every good and our existence itself is God's gift. We did not create them, we do not deserve them, and we do not own them. When God asks us to give everything back to him, we have no grounds to think God unjust or unkind. We exist only because of God's grace, and we can affirm our existence rightly only by our gratitude. In gratitude we acknowledge both our dependence and God's grace. We prove our gratitude and our belief in God's grace by placing ourselves into God's hands and trusting completely in his goodwill. In the posts yet to come in this series we'll learn more about this understanding of the source and nature of true humanity and true human identity, and how we may live out that identity in ways that provide true freedom and personal dignity. Despite all the temptations we face in a me-centered culture to find freedom and dignity elsewhere, there is no other source than the perfected humanity of Jesus, which, by the Spirit, he shares with us. Stay tuned to learn more! Good stuff! So encouraging to realize that Jesus is sharing his perfected humanity with us. His wasn't some "super-human-ness" but our own humanity brought to perfection through suffering and time. Just that understanding alone makes him more approachable and believable. God's Story (in Christ) truly is our story! "His story is our story." How profound and liberating! Thanks for your commment Jerome.